Miami Art Week is finally upon us – the time of year when the city’s art frenzy is at an all-time high: visual, performance, photography, architectural, video, sculptures and so much more. Endless frolicking through South Beach and Wynwood’s satellite fairs is guaranteed to work up anyone’s appetite. So, after consuming all that art, it’s time to consume some delicious grub. We’ve got you covered! Once you’ve strolled the Untitled and SCOPE Miami Beach exhibits, pitched on the soft sandy beach, cross the street and head over to LT Steak & Seafood. Housed in the historic landmark, The Betsy Hotel, this modern restaurant is one word = timeless. A classic American standard, aptly named after the award-winning Executive Chef Laurent Tourondel, this is where you want to eat, period. The warm, earth-toned space is filled with a curated collection of artistic black and white prints with a sprinkle of mirrors. Just as welcoming is the live nightly jazz, the longest running jazz series in Miami Beach. First to arrive at your table is a steamy basket of super-sized, and quite scrumptious popovers. Served with warm butter, this hollow bread showcases a perfectly golden brown crust. Made with three cheeses (emmental, gruyere, fontina) and a hint of cracked black pepper, it’s an exemplary taste of the food to come. Brace yourself. Wine lovers will delight in LT Steak & Seafood plentitude of offerings. Before you begin, pair the following two dishes with a light-bodied Spanish Albariño wine bursting of pineapple and other refreshing citrus notes. 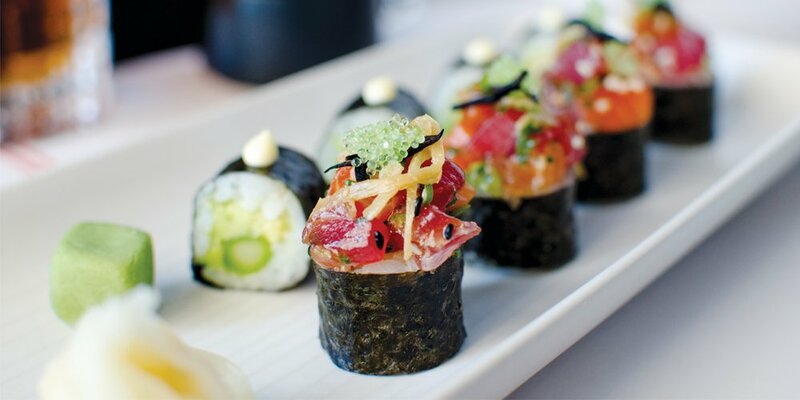 Start with the ahi tuna & salmon poke, freshly diced and delightfully rich in flavor, which deserves a fanfare. Among the ingredients: pickled ginger (sweet and spicy), wasabi tobiko (fish roe), and hijiki (seaweed). Yummy! Next up is the watermelon & heirloom tomato dish – just magnificent. Pomegranate vinaigrette is poured all over it, and the meatiness of the tomato meets juicy watermelon meets salty feta cheese meets sweet mint leaves meets thinly-sliced serrano peppers for an added kick. Enjoy every bite of this! Now, let’s bring on the debauchery of succulent meats! To enhance the experience, feel free to choose from a variety of steak sauces: Café de Paris Bearnaise, Red Wine, Green Onion-Ranch Shallot, 7 Peppercorn-Armagnac, and more. The tender, intensely flavored Wagyu Skirt Steak, served medium, is a full 10-ounce explosion of well-seasoned smoky and savory notes. The buttery side dish in a cast iron square skillet, potato gratin “soubise” was loveliness. Pair with a perfume-scented Pinot Noir for a full sensory overload. Also served medium for the perfect pink is the 8-ounce Filet Mignon, robust and moist beyond belief. The garlic butter sauce alone was heavenly. A glass of Cabernet Sauvignon with this dish dances on the taste buds. Drum roll, please! Leave room for dessert: the coconut meringue panna cotta with key lime sorbet, and the guava torticas de moron with tons of tropical fruit and lemon sorbet. Stellar! LT Steak and Seafood, The Betsy Hotel, 1440 Ocean Drive, Miami Beach, FL 33139. Reservations: 305-673-0044. Steps away from the famous Art Basel sits the breath-taking Chotto Matte Miami. Serving up refined Nikkei cuisine, here you’ll find the best of Japanese and Peruvian dishes coming together. 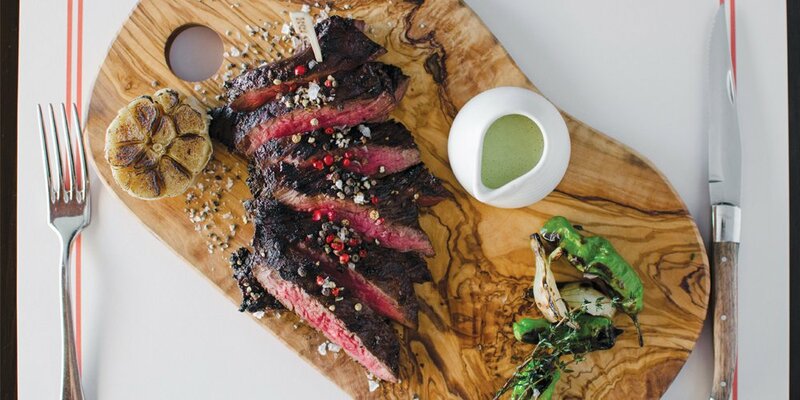 Just off the beaten path of Lincoln Road, this crowd-pleasing restaurant is one word = epic. With its big city swerve, you feel as if you’re in New York City, Tokyo or Berlin. The space is urban, avant-garde, tropical, and moody all at once. While the vibe is buzzing with conversation and laughter, the décor is fabulous: zig zag patterned marble floors, statuesque palm trees grazing the wood ceiling, and vibrantly painted murals by local commissioned artists. Meanwhile, the retractable roof invites the stars to shine brightly. Surrounded by all this creativity, the inventive dishes are just as artful. The restaurant has several cooking sections (Sushi Bar, The Robata, Sautee, Tempura) and you’ll want to order from each. Trust me on this. The small plates are meant for sharing. But, first thing’s first - indulge in a traditional Pisco Sour made with pisco, lime juice, simple syrup, egg white, and Chuncho bitters - so refreshing, Cheers! Order the flavorful shishito peppers, a generous portion served warm with sweet and salty-tasting den miso sauce. The Nikkei sashimi – such a burst of flavorful goodness! - boasts yellowtail, cherry tomatoes, jalapeño, cilantro, and yuzu truffle soy. 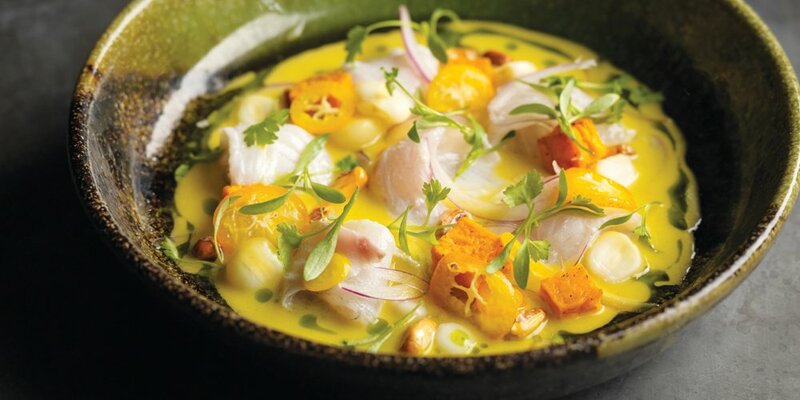 Who doesn’t love a good ceviche, and Chotto Matte delivers big time! Every mouth-watering bite will leave you wanting more: branzino sashimi, sweet potato, Peruvian corn, cilantro, chive oil, and citrus sauce. The yumminess of their Nikkei gyoza is pure comfort food: chunks of pork and shrimp wrapped in yucca dumplings and served on sweet potato puree with citrusy and spicy red pepper ponzu. Make this a double. The tasty beef fillet tataki is thinly sliced slivers of expertly marinated meat. 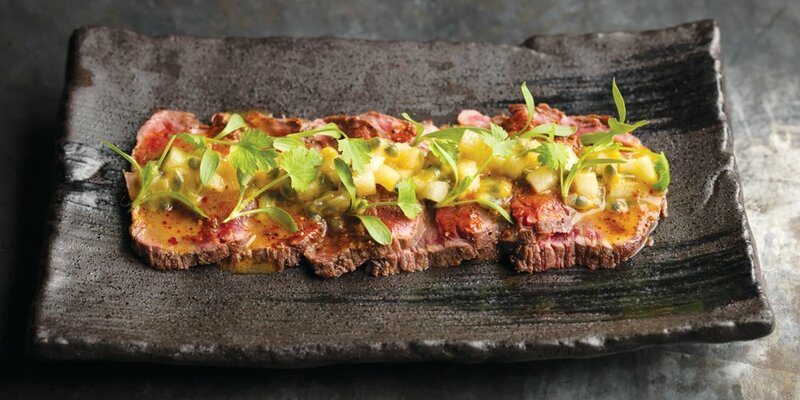 It’s served warm with sweet and smoky aji panca, and a lush passion fruit salsa. Ahh! Now the pollo den miso is something we’re still craving: tangy chicken miso, crisp daikon, and yellow chili salsa with a slight crunch from the carrot. One of our favorites! Get ready for the sheer juiciness that is the chuleta de cordero ahumada. Marinated and smoked, these large lamb chops are served with rich Peruvian chili miso. The tentáculos de pulpo (octopus tentacles) are a thing of beauty, paired with aromatic yuzu and lovely drops of purple potato purée. Don’t forget the sushi! The sato maki is a dish filled with delicate yellowtail, melting salmon, red pepper, and lime soy. It’s lit at the table with a blowtorch. Talk about a performance! The delightful dessert options are aplenty here, so make it easy on yourself and just go for the platter. I recommend the molten salted caramel chocolate fondant (AKA petit gateau) served with orange, vanilla ice cream and mandarin sauce. It will take your breath away. The brûlée de la passión almond cake with aji amarillo (a staple in Peruvian cooking) and guava sorbet is to die for. Last, but not least, we all scream for Mochi ice cream: mango, and Thai basil to be exact! Chotto Matte Miami, 1664 Lenox Avenue, Miami Beach, FL 33139. Reservations: 305-690-0743. Third on our list is Three (pun intended)! Following the extraordinary Latin American art fair, PINTA Miami, head on over to this establishment where you will find the New World culinary masterpieces of James Beard Award-winning chef Norman Van Aken. Tucked away in the Wynwood’s artsy Arcade building, this restaurant is one word = eclectic. Three, which just celebrated its first anniversary, is named after the team’s onsite concepts: fine dining establishment, rooftop alfresco bar, and cooking school. An open kitchen invites guests to view the behind-the-scenes brilliance, and dine at the counter to converse with the chefs as well. The elevated décor is ultra sophisticated, with its hexagon-shaped marble floor tiles, eye-catching shades of deep blues and greens, plush velvet seating, black mirrored tables, lacquered portrait of Frida Kahlo, and so much more. Swoon! Begin your journey into bold taste sensations with the unforgettable Norman’s Revenge cocktail - tequila, lime, agave nectar, and jalapeño rimmed with a healthy dose of black salt. Three’s diverse cuisine and inspired menu is as polished as the sleek ambiance. Be sure to complement your three-course meal with a three-course wine pairing! The creamy cracked conch chowder, poured from a pitcher, is ecstasy: coconut milk, star anise, saffron, and citrus. It’s no wonder that it’s one of their most requested dishes. Outside of a fishing town, this is the best-cured fluke crudo you will find around these parts. The freshness of delicate fluke plays well with the crunchiness of the crispy quinoa, tartness of crème fraîche, and acidity of dashi vinaigrette. Textured flavor galore. The octopus a la plancha is a top-notch mouthful! Here it is served with distinctive shishito pepper kosho, bright and beautiful marigolds, and topped with a cilantro salad. Wood-grilled anything is always a good thing, and Three’s tender and flaky swordfish (with saffron-vanilla butter poured over it!) bodes well with savory, glazed Chinese broccoli. 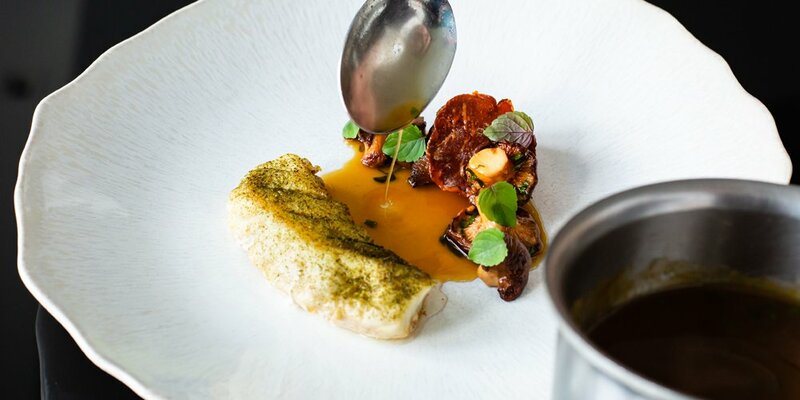 Behold the butter-poached grouper, an outstanding creation made with nutty jamón ibérico, wild chanterelle mushrooms, and salty fresh seaweed jus. 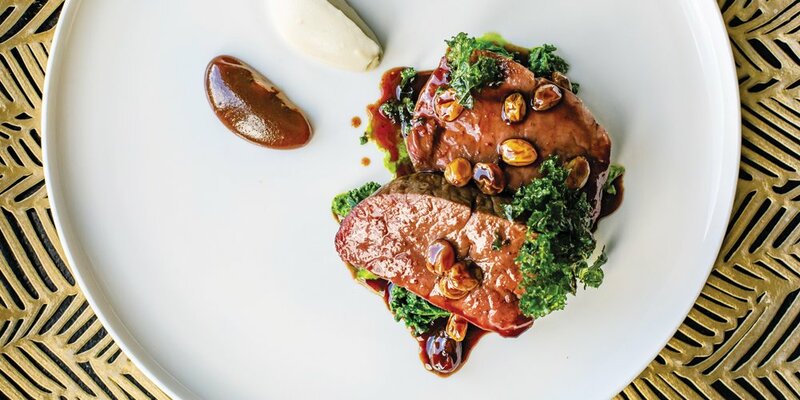 The slow roasted saddle of venison, with aligote wine and a side of coconut creamed kale, is as gourmet as one would expect. Finish your meal with a splendid artisanal cheese voyage around the world. Three, 50 N.W. 24th Street, Miami, FL 33127. Reservations: 305-748-4540.